There is a reason why I require my approval before a comment can be posted. I receive anywhere from 5 to 15 spam comments per day that basically first tell me that my blog is great and then try to sell some product with a link. All of those comments are deleted. The next post will be published next Monday. I manage this portfolio of fund by doing nothing. The management strategy is to buy and then hold until the DOD. Once shares are bought, my only option is to reinvest dividends or to take the distributions in cash. Last year, I changed all of the dividend options to payment in cash and will continue with that option until there is a stock market Catastrophic Event, which I define as a 45%+ decline in the S & P 500. Since I started to invest, I have been through three of those events. The two Spectrum funds are fund of funds. The government reported that real disposable personal income fell .1% in September while real personal consumption expenditures rose .6%. That is just a disconnect. The personal savings rate was 3.1%. The downtrend has occurred notwithstanding low interest rates and with homeowners able to deduct both property taxes and mortgage interest. New York Lawmaker Says Proposal to Keep Property Tax Break Is ‘Gaining Traction’ - Bloomberg I am assuming in the following calculations that property tax payments can still be deducted for those who itemize. Under the GOP's tax plan, it is crystal clear that millions of middle class homeowners will lose the deductibility of both property taxes and mortgage interest payments due to an increase in the standard deduction amount. Then the GOP takes away most of the SD increase by eliminating all exemption deductions currently valued at $4,050 per exemption. I would suggest looking at your 2016 tax return and plug in the numbers. It is obvious that the GOP is using the middle class to fund tax cuts for the uber wealthy and corporations. Then ask yourself a simple question. How does the GOP plan to offset in part the lost tax revenue caused by slashing the tax obligations of the uber wealthy and corporations? The GOP's intent is clearly revealed by the result which is not difficult to understand. It is purposeful because it is so blatantly obvious. The negative impact on home prices from the GOP's tax plan, as currently outlined, is a clear cut issue as well. Demand for home purchases will be curtailed and prices will decline in localities most impacted by the removal of tax incentives connected to home ownership. Then the affordability issue is further negatively impacted by taking away most of the increased SD through the exemption deduction elimination. The plan could not possibly be clearer on its intended negative impact on the middle class. George Papadopoulos: The Mueller Probe's First Guilty Plea - The Atlantic ("The biggest revelation in the plea agreement concerns an April 26 meeting in London. Papadopoulos met with the Professor, who told him that the Russians had “dirt” on Democratic candidate Hillary Clinton. The government filing says the Professor said that “the Russians had emails of Clinton,” and in fact “thousands of emails.”") It was not until June 14, 2016 that the DNC disclosed it had been hacked. The GOP's detailed tax plan is scheduled to be released tomorrow. State, local income tax deductions to be repealed in House bill, Brady says - MarketWatch Note that Mr. Brady, as do all republican politicians, mentions only the increase in the standard deduction without mentioning the offset caused by eliminating the exemption deductions. If the exemption elimination is kept, Mr. Brady is deceiving the public by mentioning the SD increase and "forgetting" to mention the exemption elimination that takes away most of the SD increase. I have not heard a single republican mention the exemption eliminations which was in their draft plan released last month. I expect that the republicans will be raising my federal tax obligation some, but nowhere near as much as upper middle income households in high tax states. I am over 65 so I will lose the extra Standard Deduction for my age, the regular standard deduction and my personal exemption. Altogether those deductions are currently worth $11,900. I will receive an increase in the SD to $12K, netting a benefit of a $100 deduction. I am currently single and retired with no debt and live in a low tax state. My 2017 property tax on my home was about $2,200 (over $420K in FMV) and my only state income tax is the current 5% levy on reportable interest and dividend income after a $1,250 SD. Reportable income excludes interest paid on Tennessee Municipal Bonds, U.S. government interest payments, interest paid by CDs/savings accounts, etc. What are examples of nontaxable dividends and interest?-Tennessee Department of Revenue There is no individual income tax on earned income, retirement account withdrawals, pension income, profits from security and asset sales, etc. If the GOP keeps the proposal of raising the bottom rate to 12% from 10%, that will hit me as well, likely causing a tax increase since I am currently in a low tax bracket and have no earned income. (e.g. 2% of $40K is $800). My only pension is SS. I would also take a $1K+ hit in the event the GOP eliminates the foreign tax credit for individuals. I expect nothing positive and anticipate paying more. The GOP will try to sell their plan to the middle class by arguing that their wages will increase by at least $4K per year as corporations trickle down their tax savings to workers. Sure, that is garbage but many Trump supporters will buy into it for now. Wait 4 years after the GOP passes this bill and ask them again, maybe some will remember the pledge and will compare the promise with the actual results. The willingness to share income with worker bees is proven by republican and business support for unions seeking higher wages over the past 100+ years and workers' increasing share of income generated by their labor over the past 50 years. Maybe I got my history wrong there with my brain being polluted by too much GOP jive. The GOP and businesses have been vehemently opposed to unions seeking higher pay over my entire lifetime and businesses are increasing their share of income generated by workers' productivity. Hopefully, I will know more tomorrow. As with my other 10 share purchases, I will average down in 10 share lots using commission free trades, but will not average up. The stock was trading below its 50, 100 and 200 day SMA lines when I made this purchase. Chart In early October 2017, the stock was trading at over $39 and closed at $39.51 on 10/5/17, the day before the quarterly ex dividend date. At the current quarterly rate of $.49 per share, the dividend yield at a total cost of $33.5 is about 5.85%. 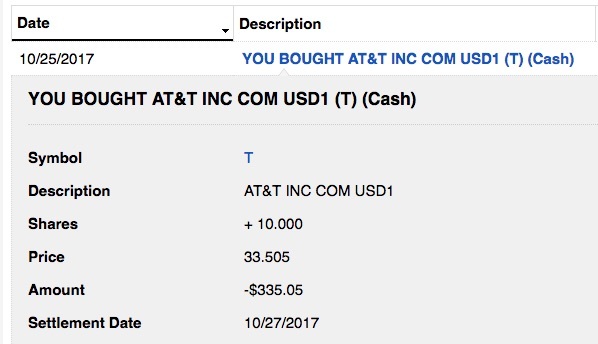 I currently own 70 AT & T shares, a totally immaterial allocation. That bond will go down with a rise in interest rates. The stock may go down for that reason and others including the problems highlighted in the last earnings report. 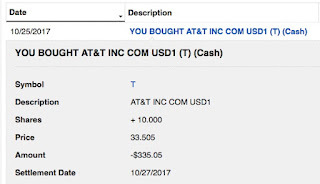 As to interest rate sensitivity, the AT & T common shares are in part a bond substitute; and its debt is huge and in need of constant refinancing. POST $81.57 -$1.09 -1.32% : Post Holdings, Inc.
THS $66.19 -$2.15 -3.15% : Treehouse Foods, Inc. I eliminated my GIS position in 2016 and have not bought a share back prior to this 10 share buy. When I discussed selling 2 GIS SU bonds maturing in 2027, I indicated than an intent to buy the common shares "provided the price declines below $52 and preferably below $50. Stocks, Bonds & Politics: Item # 4.B. I compromised by buying 10 at $50.7 and then averaging down in 10 share lots using commission free trades. The next 10 share buy range would be between $48 to $49.5. The current quarterly dividend is $.49 per share and was last raised from $.48 last July. The yield would be about 3.87% at a total cost per share of $50.7. The stock is trading below its 50, 100 and 200 SMA lines, using a two year YF chart, and has been in a waterfall decline since 7/3/16 when the stock closed at $72.46. GIS Interactive Stock Chart The five year chart shows support in the $49-$50 during 2013-2014. Given the dramatic slowdown in earnings growth, future dividend increases will likely be in much smaller percentage increments than in the past. For example, GIS more than doubled its penny rate from between July 2007 ($.195) to April 2014 ($.41). I would not expect that to happen again in the ten year period ending in April 2024 or even come close. GIS is in disfavor now, as are other packaged food companies, and recent earnings reports have served only to reinforce the negativity. The last GIS report was met with discernible negative reactions by institutional investors. "First-quarter net sales for General Mills' North America Retail segment totaled $2.44 billion, down 5 percent from the prior year, reflecting low single-digit declines in contributions from volume and net price realization and mix. Organic net sales also declined 5 percent. Net sales were down double-digits in the U.S. Yogurt operating unit, driven by continued declines for Yoplait Greek and Yoplait Light products, partially offset by benefits from the new Oui by Yoplait product launch. Net sales in the U.S. cereal operating unit were down 7 percent, reflecting a reduction in customer inventory levels and unfavorable trade expense phasing, though cereal retail sales performance was much stronger, with sales in Nielsen-measured outlets down 1 percent. U.S. Snacks net sales declined 2 percent in the quarter, with declines on Fiber One partially offset by growth on Lärabar and Nature Valley. Segment operating profit of $533 million was down 15 percent due primarily to lower volume, unfavorable trade expense phasing, higher input costs, and an increase in advertising and media expense." I doubt that the Oui Yogurt will be a barnburner product after trying all of the varieties and taking into account the cost. IMO, GIS is doing what it can to prosper, principally in acquiring other companies that have organic products like Cascadian Farms and Annie's. The better than expected earnings report from Kellogg this morning has caused packaged food company stocks to rise in price today. Last Discussion: Stocks, Bonds & Politics: Item # 2.A. Sold 50 BDGE at $35.03 (4/23/17 Post)(profit snapshot = +$372.06). E.P.S. was reported at $.49 per share down from $.5 in the 2016 third quarter. While there were more shares in the 2017 third quarter, the bulk of those shares were from a share offering completed in November 2016. Another problem was the increase in non-interest expenses: "Non-interest expense for the third quarter of 2017 increased to $21.3 million from $19.2 million in 2016. The increase reflects growth in salaries and benefits expense, other operating expenses, and occupancy and equipment". While still excellent, there was a notable percentage increase in the NPL ratio to .26% from .08%. BDGE had been adding some branches through acquisition. The company announced a "branch rationalization" plan to close a number of locations that will result in a pre-tax charge in the 2017 4th quarter of "no more than $6.6 million". Given the history, I did not care for that either. ROA and ROE remain below the national averages at .88% and 8.41% respectively. And, lastly, the dividend has not been increased since I first bought shares. My consider to repurchase price would be less than $27.65, the price paid for my last purchase made on 10/26/16. That lot was later sold at $35.03. The price will have to fall below $9 before I will consider repurchasing shares. Of course, there are no proceeds realized by the company which would be the case for a stock offering sold to the public, and consequently no proceeds can be used to buy more properties to generate cash flow to support the current dividend, let alone dividend growth. As a result of more shares and no cash paid for those shares that could be used to buy properties, the dividend will be reduced in 2018 to an anticipated range of $.65 to $.75. Bluerock Residential Growth REIT (BRG) Announces Potential Range of Anticipated Class A Common Stock Dividend for 2018 I would go with the low end number until proven otherwise. The current annual rate is $1.16 per share paid in monthly installments of $0.096667 per share . I doubt that individual investors are attuned to the upcoming common share dividend slash. In my Schwab account, I had $4K in treasury bills mature on 10/31/17 and $9K in short term CDs maturing on 10/30 and 10/31. I elected to buy this CD with some of the $13K in proceeds. The WFC CD pays more than any of the maturing CDs. The T Bills had a .75% coupon. More redemption proceeds was received on 11/1. I am waiting for higher rates on shorter maturities. About 25% of the redemption proceeds from short term bonds and CDs are currently being reinvested in higher yielding CDs. About 10% of the proceeds are being used to fund my 10 share lot buying spree of out-of-favor stocks, with the remainder remaining in a sweep fund for later disposition. Notwithstanding my statements made in my last post, I bought two separate Tennessee Municipal Bonds this morning, buying $10K in principal amount (Aa2 and AAA rated), and spending $4,370 for one $5K lot and $4,788 for the other. I will discuss those trades later. These purchases are being financed with proceeds from stock dispositions. In making those purchases, I am looking at my personal financial situation and a lack of any need to grow capital. So I decided to place a little more emphasis on high quality Tennessee municipal bonds that generate a current tax free yield of 3.02+% in the aggregate. I will be using the income generated by those bonds solely to buy more. The current principal amount is now at $260K.